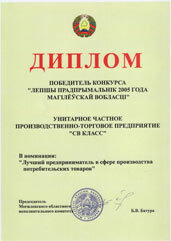 of school furniture since 1995. 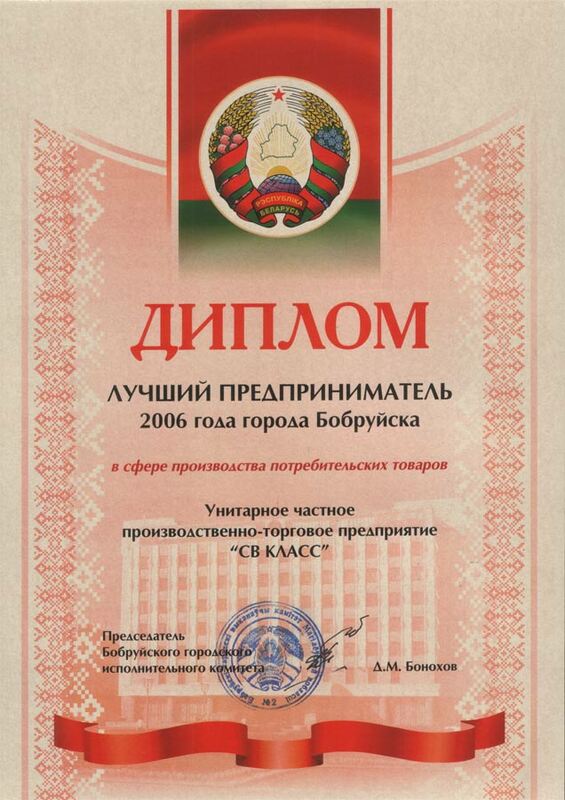 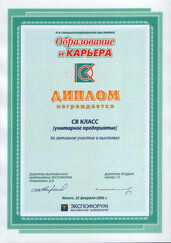 Quality mark "BETTER TO CHILDREN"
Diploma of the laureate of the contest "The Best Entrepreneur of 2007 in Mogilev region"
The diploma of the Universal exhibition "Bobruisk spring-2007"
Quality Mark "BEST TO CHILDREN"
In 2008, the National Russian program to promote the best goods and services for children Quality Mark certificate "Best - children" have been assigned the following names of school furniture "SV CLASS": Desks for school , chair student , writing table , wardrobe combined laboratory , set of furniture laboratory . 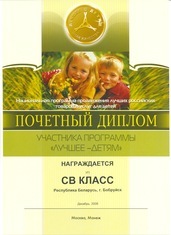 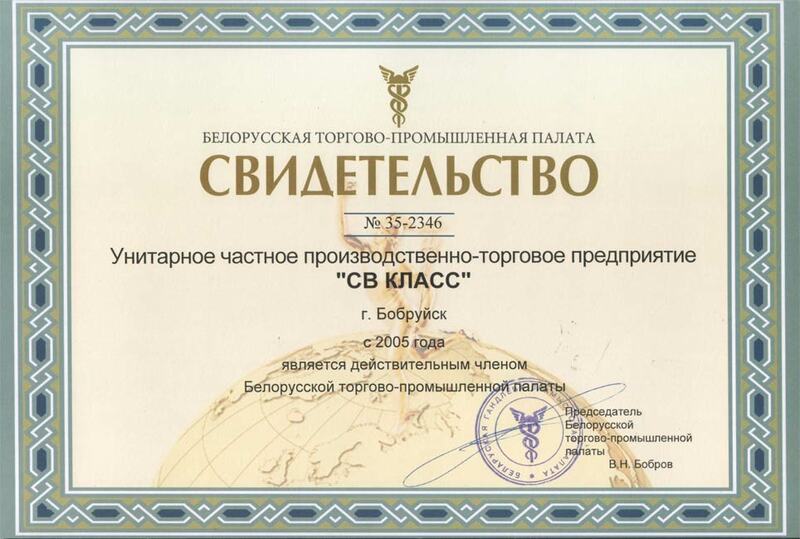 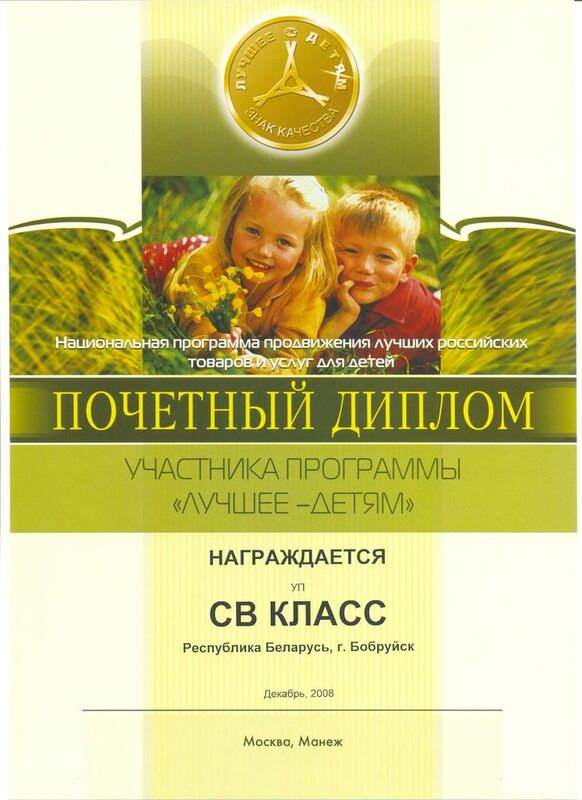 The sign of quality "Best for children" attests to the high quality of the products and the level of organization of production, confirms that the products have been evaluated by the Joint Expert Commission, formed on the basis of the Federal State Institution "Russian Testing and Certification Center - Moscow" (Federal Agency "Rostest-Moscow") Rostekhregulirovaniye . 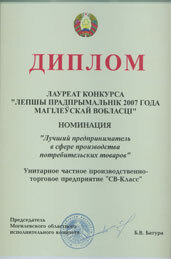 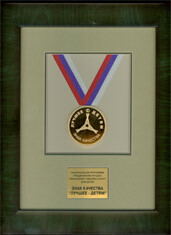 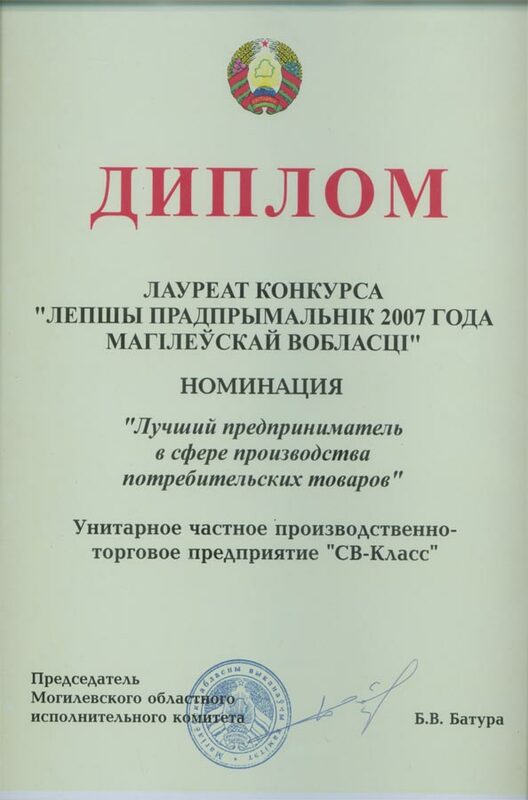 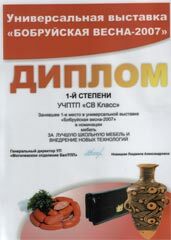 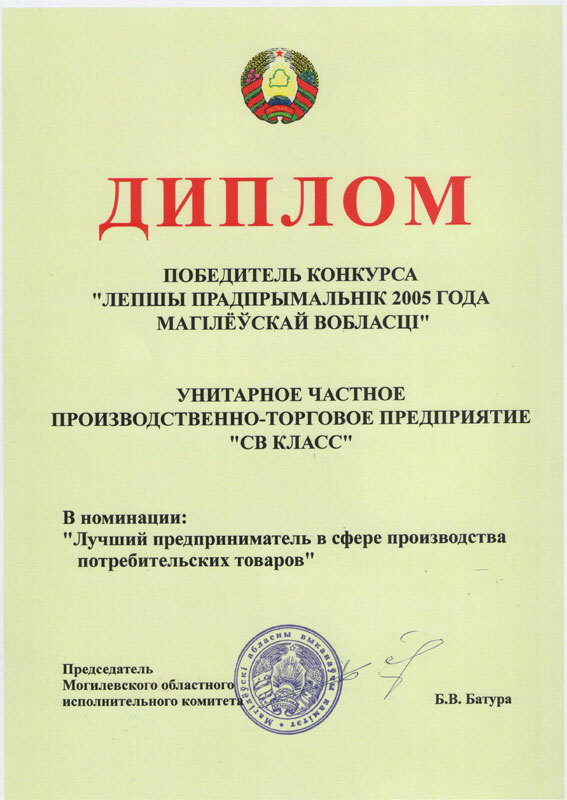 "The Best Entrepreneur of 2007 in Mogilev region"
"Lepshy pradprymalnik 2007 of Magileuiskaya Voblasny"
"The best entrepreneur in the sphere of consumer goods production"
In the middle of March, 2006 the results of the competition «the Best businessman of 2005 of the Mogilyov region» were summed up. 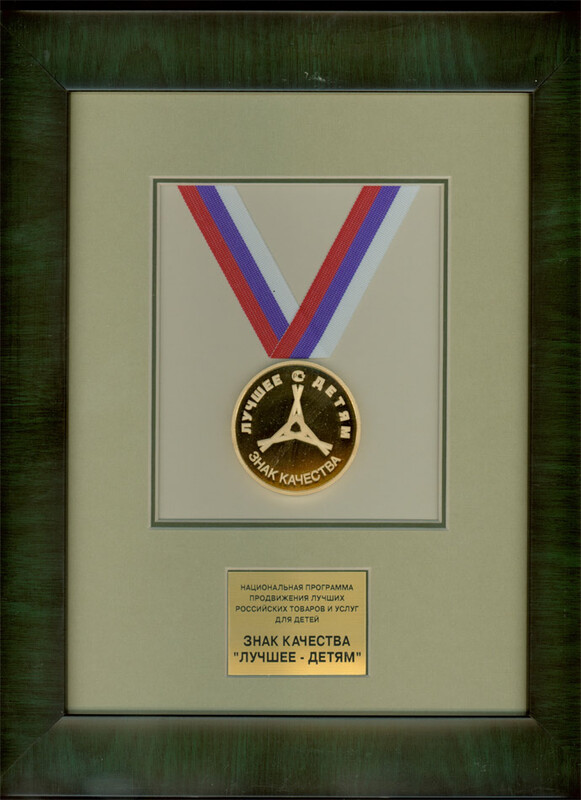 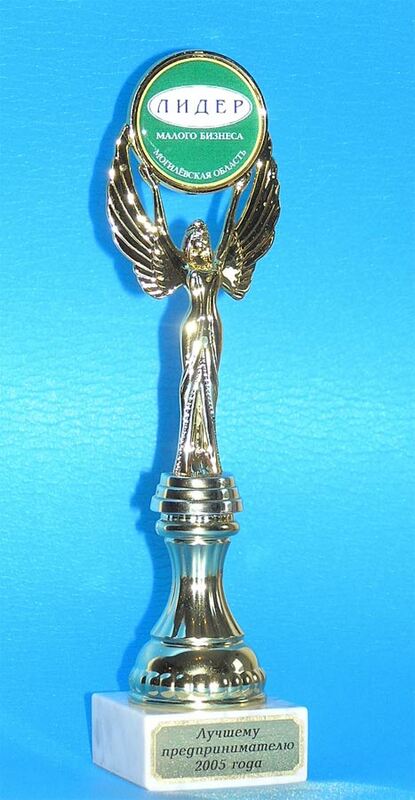 The unitary private industrial-trade enterprise «SV Class» won «Production of the consumer goods» nomination. 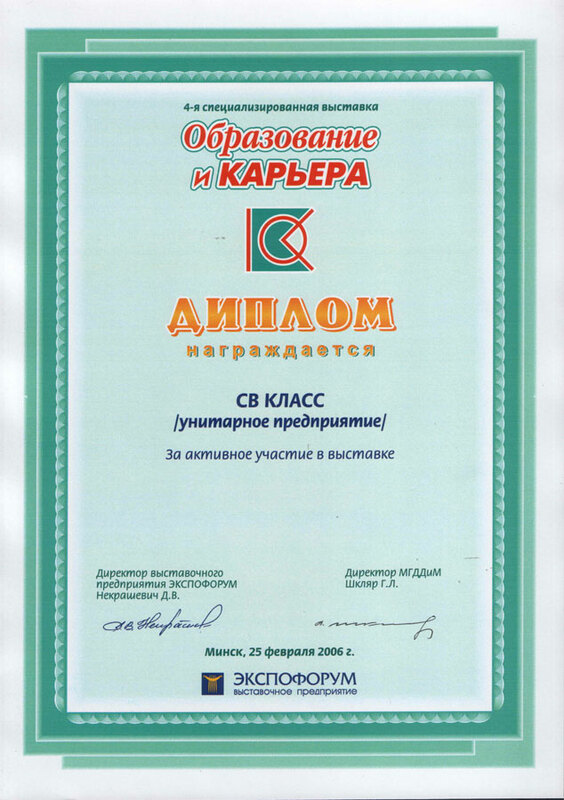 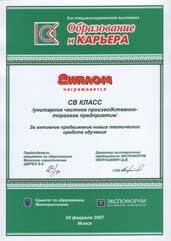 "the Best businessman of 2005 of the Mogilyov region"
In the middle of March, 2007 the results of the competition «The Best Bobruisk businessman of 2006» were summed up. 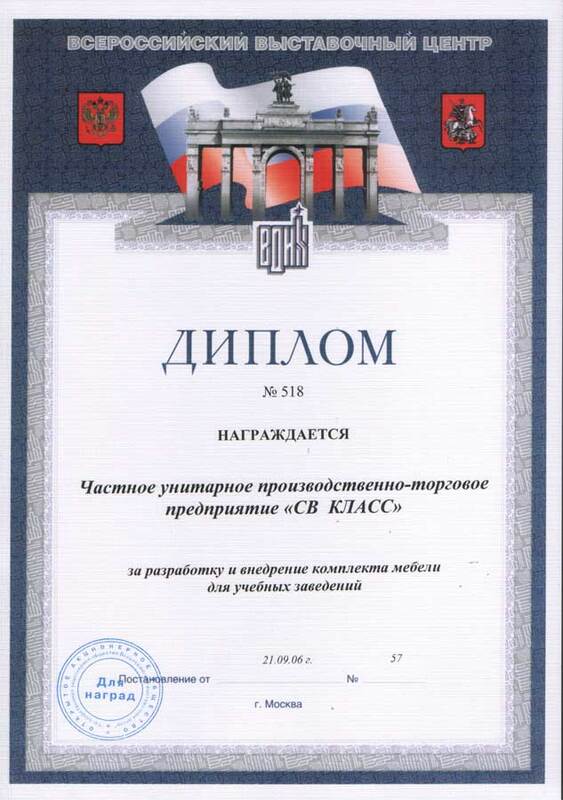 The unitary private industrial-trade enterprise «SV Class» won «Production of the consumer goods» nomination. 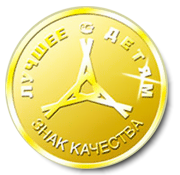 in the sphere of consumer goods production. 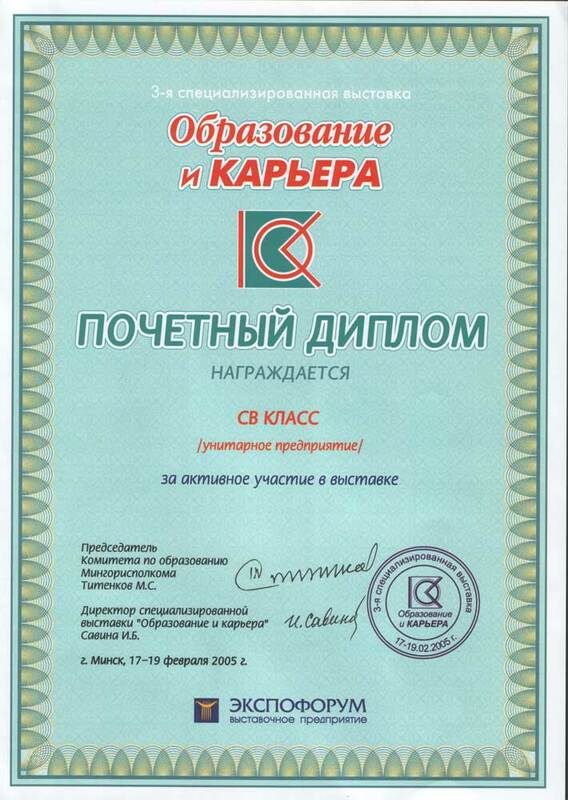 for working out and adoption of the complete set of furniture for educational institutions. 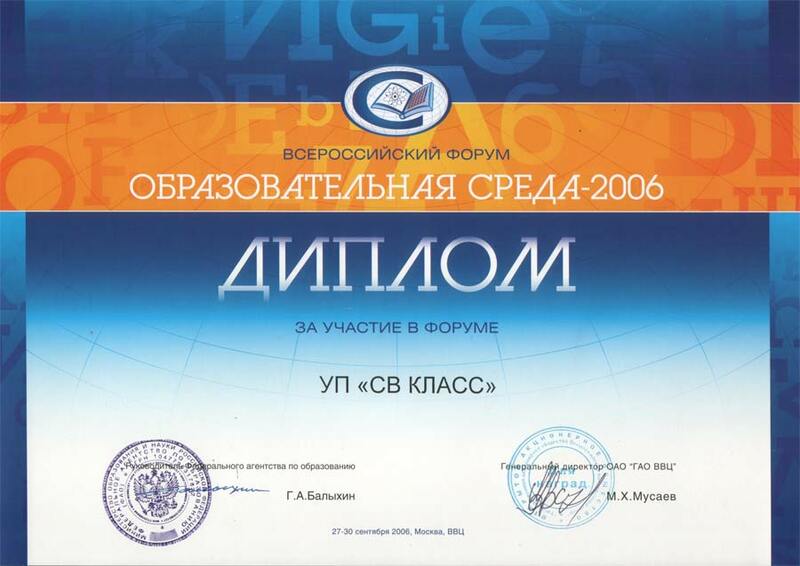 unitary private industrial-trade enterprise «SV Class». 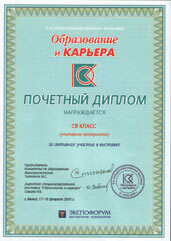 3rd specialized exhibition "Education and career"
is awarded with a diploma for active participation in the exhibition. 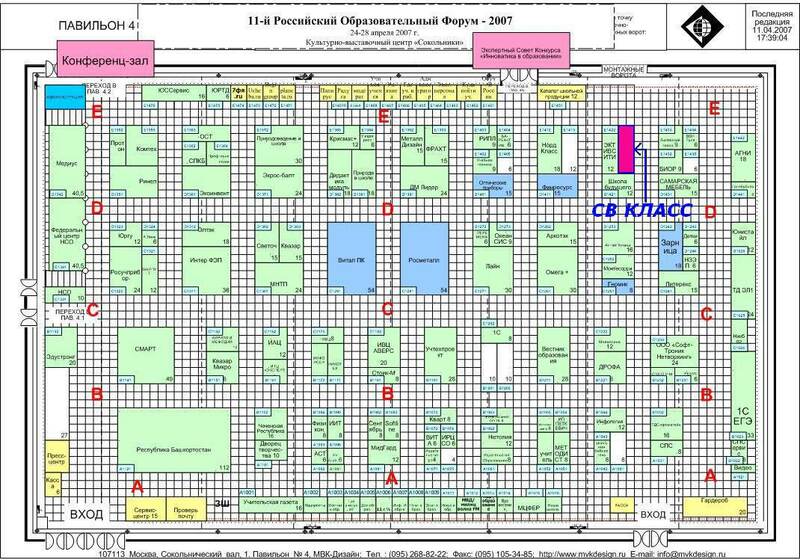 The Chairman of the education committee Minsk City Executive Titenkov M. S.
The director of a specialized exhibition «Education and career» Savina I.B. 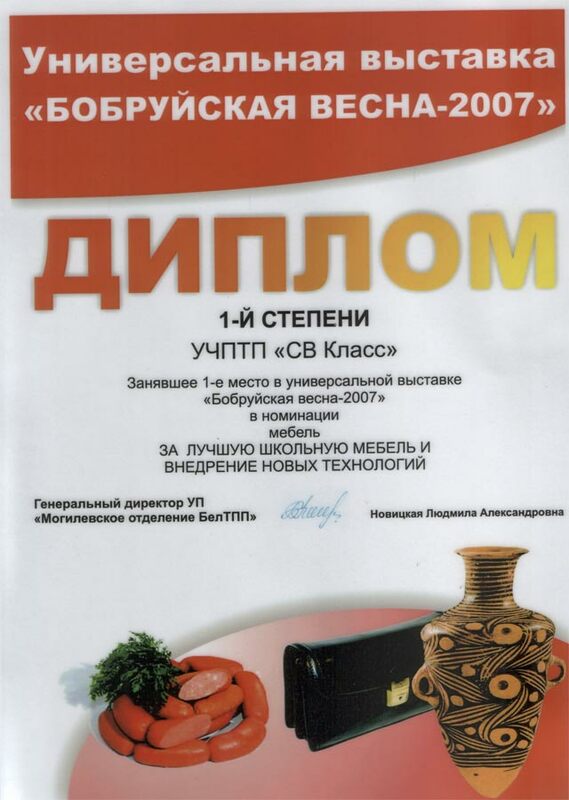 4th specialized exhibition "Education and career"
The director of exhibition enterprise EKSPOFORUM Nekrashevich D. I. 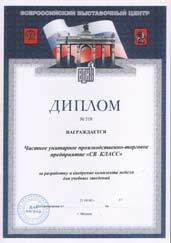 Director MGDD and M Shkljar G. L.
5th specialized exhibition "Education and career"
The chairman of committee of the Minsk Executive Committee of the City Soviet of People's Deputies by training ShCherbo V. K.
The director of exhibition enterprise EKSPOFORUM NEKRASHEVICH D.V.